Just wanted to quickly pop in and show you a couple of cards I made, used the same printed papers, image and embellishments on both but with a different coloured background card and different layout. I have added a couple of Meiflower Jingle Bells to each card, these little bells are a perfect addition to Christmas cards, come in red, green, gold and silver and also a couple of different sizes. I have used the smallest, but bigger ones are available. 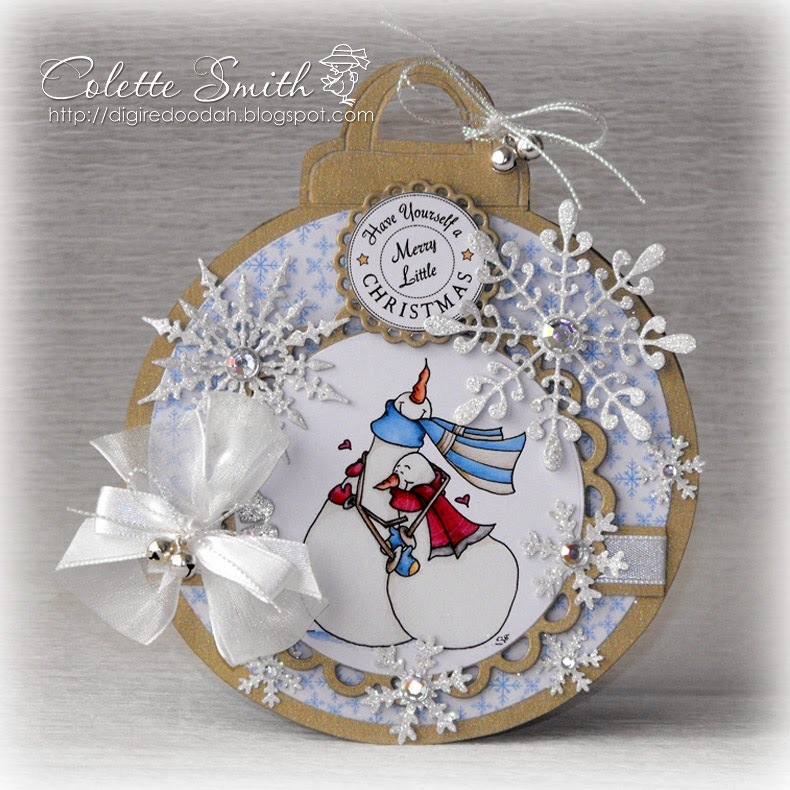 Today I have a bauble shaped card to show you (template on my blog if you want to snag it). 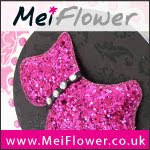 The card has three bows, one made of 25mm organza ribbon, one of 10mm satin ribbon and one from white metallic cord (all available from Meiflower) layered on top of each other - the metallic cord also has a couple of Meiflower jingle bells tied onto it. I have die cut and punched some snowflakes to decorate the card and added Meiflower aurora borealis stick on gems in a variety of sizes to the centre of each one. I am not about as much as I would like to be at present, because as well as being full time carer for my disabled daughter, I am also looking after my two year old grandson most days while his mum and dad are at work and he has gone from a having a couple of hours of sleep a day, (when I could get a bit of crafting done), to not sleeping at all through the day and constantly wanting me to play with his cars or read his tractor books, (I am becoming quite an expert on tractors LOL!). We have also recently found out that my 82 year old Father in law has widespread cancer so with one thing and another I just can't find much time for crafting, although,I do what I can when I can, as it's the only thing that is keeping me sane at the moment. 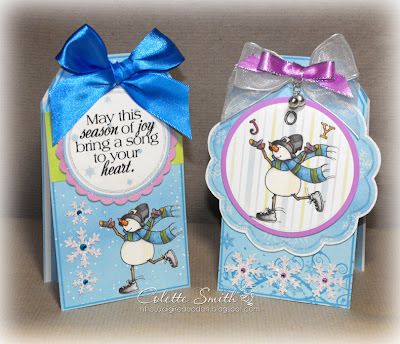 Here are a couple of cards I made using the Snow Much Joy ultimate kit from Paper Creator, the kits contains a Sassy Cheryl image, colour matched papers, a ready to print easel card and a make me a topper set as well as some extras like the tags I used for the tag cards below. I made two tag shaped cards embellished with a sentiment and make me a topper set from the kit and finished them off with various Meiflower goodies, ribbons - satin, organza and metallic edged - stick on gems in lilac and blue and little silver jingle bells.